Update: The special edition retail DVD refered to below is now completely sold out. However, we are still taking institutional orders from universities, libraries, organisations. please contact tosingaporewithlove@gmail.com. Thank you for your support. By popular demand, we are taking orders for the award-winning and banned film To Singapore, with Love DVD here. Its a meaningful gift to your friends and family. Please note, due to the MDA ban, we can mail only to an address outside Singapore. Prices are in US dollars, while stocks last. Thank you for your support. Languages: Mandarin, English, Hainanese and Malay. Subtitles: English and Chinese (simplified). But I want to watch it now. 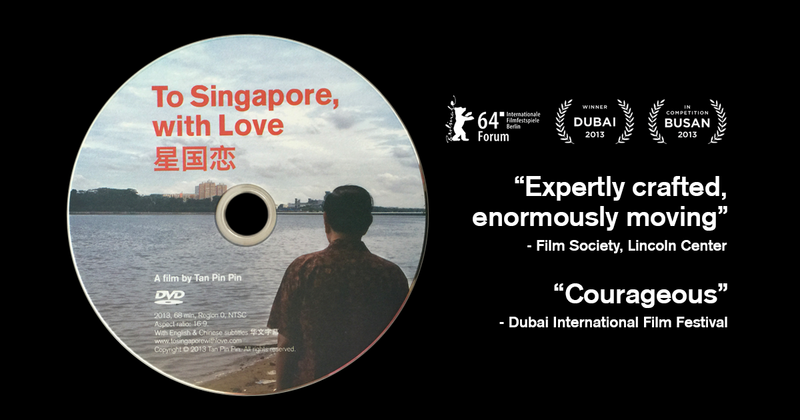 You can watch To Singapore, with Love streamed on VOD on Vimeo now using a non-Singapore IP address. Where will this DVD ship from? We are required by MDA to ship this DVD from outside Singapore. As we are a small outfit and fulfilling the orders ourselves, we will batch mail DVDs once a month. Please give us at least 6-8 weeks for the DVD to get to you. More importantly, give us a mailing address that is valid for the next 2 months from date of order. Note: we are not able to hasten or delay shipment for specific orders. Sorry about that. This DVD is licensed for home-use only. Outside Singapore, to acquire it for your club, conference, festival or university library, you need an educational licence. Please email to.singapore.with.love@gmail.com to enquire about this license. Thank you, with Love from the To Singapore, with Love Team.